The 2019 Homeless Point in Time (PIT) Count will take place in Immokalee Thursday January 24th and in Naples Friday 25th, 2019. The PIT count is a tally of who is homeless on a given night and provides a snapshot of who experiences homelessness throughout the year. The participation of CoC member agencies helps our community consider next steps concerning effective homeless service provision. This event takes place in every county across the U.S. each January. Volunteers, including interested members of the civic and business community, homeless and formerly homeless individuals, and CoC member agency staff, help with this annual project. Volunteers are needed in Naples and Immokalee. Training will be conducted in the week preceding the count. If you are interested in volunteering, please contact Bonnie Seargeant, programs [@] collierhomelesscoalition.org. 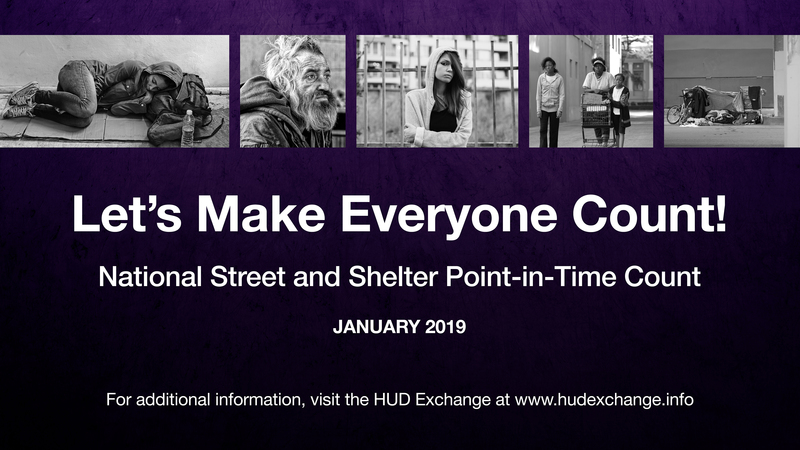 2019 Homeless Point in Time Count Training January 17th held at AVOW 1095 Whippoorwill Lane Naples 3-4pm.